This bracket system is designed to mount an aftermarket Sanden Style (Rotary) A.C. compressor to the popular Gen III GM LS1 Camaro/Firebird/GTO engines utilizing the factory alternator and power steering pump accessories. Bolts to head and water pump. Works well in vehicles with low hood clearance -- Trucks, 50-60’s cars, etc. Illustrated instructions for easy installation. Note: Check bracket and balancer dimensions from images to insure propper fitment. 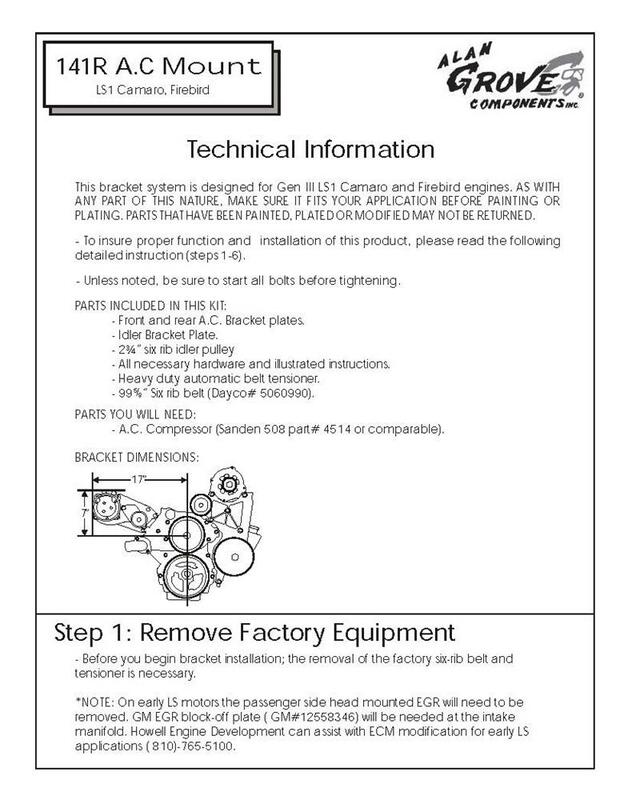 *NOTE: On early LS motors the passenger side head mounted EGR will need to be removed. GM EGR block-off plate ( GM#12558346) will be needed at the intake manifold. Howell Engine Development can assist with ECM modification for early LS applications ( 810)-765-5100.